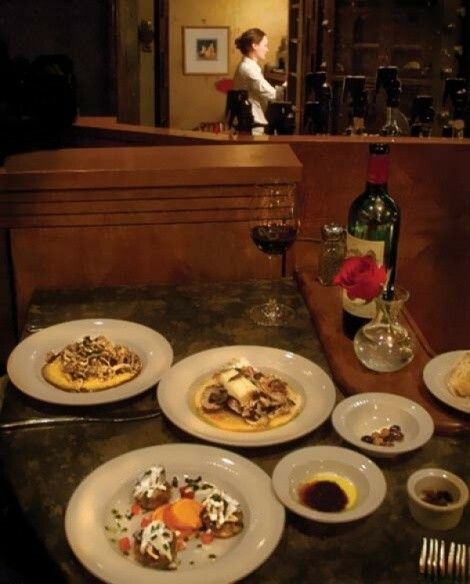 One of Salt Lake City's most romantic and urbane little restaurants. Sure, stretches of downtown Salt Lake City look and feel off-limits these days. But don’t let that keep you from making your way to Martine, one of the city’s most romantic and urbane little restaurants. Open for a decade in its historic brownstone location, Martine is still going strong with its Euro-bistro vibe. And in true bistro style, you can always just drop in and nosh at the curved bar. A handful of barstools look into a gorgeous old brass-trimmed bank vault, but the feeling is open and friendly and conversation flows, with other diners as well as the staff. So sit down, enjoy the flattering light of flickering votives, the fresh-cut roses and good jazz in the air. Nibble on a complimentary ramekin of superbly marinated olives as you peruse the excellent wine list. I almost fell off my chair when I spied a favorite— a Bouchaine Pinot Noir from Napa’s Carneros district— on my last visit. But, that’s Martine—full of quiet surprises, not the least of which is chef Tom Grant’s way with exotic seasonings and perfectly balanced sauces. Grant has a light touch and the finesse to pull off unusual combinations. Recent favorites on the tapas menu include tender, pan-seared calamari with a brightly flavored tangerine-coriander jus on a (barely) lavender risotto cake, as well as the steamed mussels with a delicate pumpkin-apple-masala jus. Golden, juniper-seared pheasant on the dinner menu (available at the bar) is beautifully moist and tender inside and served with properly thin-sliced potatoes Anna, and layered with Utah’s Shepherds goat cheese. For dessert, consider the Mission fig and bleu d’Auvergne bread pudding with cr%uFFFDme fraiche and a sampling of dessert wines. Congrats on 10 delicious years, Martine.